Not only am I in Ornament Magazine, I’m on the cover! Yay! I was interviewed earlier this year by the lovely Robin Updike, who emailed me in January to tell me that she’d been asked by the magazine to write a profile on me and my jewelry. Robin is an arts and culture writer here in Seattle, and has written many articles on art and artists over the years, including for Ornament Magazine. She came to my studio in February and we sat down for a couple of hours and talked over tea. I was on Day Two of maybe the worst cold/flu I have ever had, and honestly, I was feeling a little hallucinatory. I sent Robin an email the morning of our interview telling her that I was sick, and apologizing in advance for any coughing fits. She asked if I wanted to reschedule, and I said no because I had spent the last two days cleaning, and didn’t want to have to do that again! Ha! (It’s true). The interview was so great. Robin did have some specific questions, but mostly we just talked. It was like sitting across the room from a new friend and getting to know each other. We talked about art and jewelry and poetry and landscape, travel and family, the business of being an artist, and the connections between art and language. The exercise of having to talk at length about my work, my motivations, and why I make what I make, was extremely illuminating for me, and really clarified my thoughts on my own artwork in a way I hadn’t expected. Even if the article had never ended up being published, I would have been thankful to have had the experience of being interviewed since it gave me this chance to reflect on my work and my process in a very honest way. You can read the article on me and my work below (click on arrow buttons to scroll through all the pages of the article, and click on the + button to zoom in so you can read it). 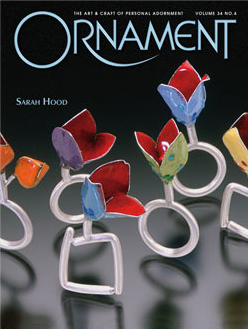 For more articles on all kinds of wearable art, visit the Ornament Magazine website.